Addictive! This is what these Greek Potatoes are. 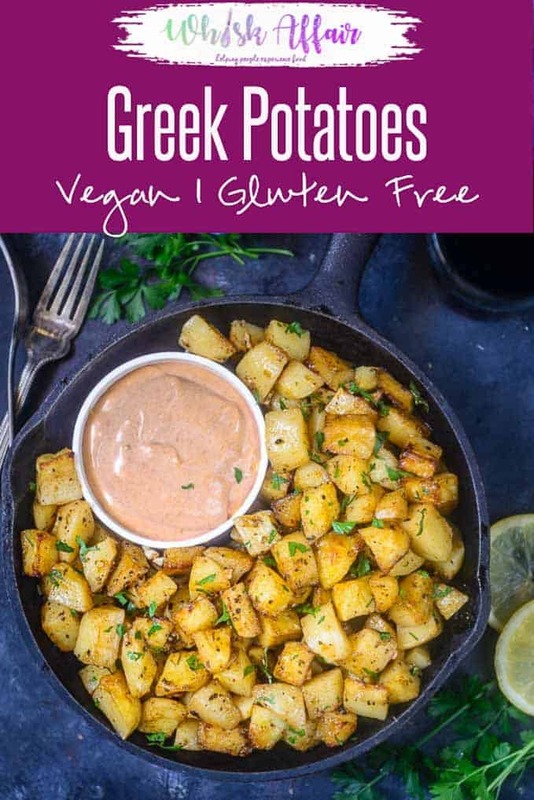 Make a batch of these best Greek Roasted Potatoes for a vegan, gluten free side or snack and enjoy them at home. Here is how to make Greek Potatoes Recipe. Did someone say potatoes? Who doesn’t love potatoes? Well I love anything and everything potatoes. They make everything yummy. Won’t you agree? With winters setting in and new potatoes in the market, it is the best time to savour on some Greek potatoes. Greek cuisine is a Mediterranean cuisine and its most characteristic element is olive oil. Olive oil and garlic render a beautiful, crisp texture to these Greek potatoes. They make for a perfect snack, side dish or a meal in themselves (if you are me :P). What are you waiting for? Get started and make yourself and your loved ones some restaurant-style Greek potatoes. Greek potatoes are much more than your regular potatoes cubes, fried or roasted. They are crisp from outside and melt-in-mouth inside and more flavourful. 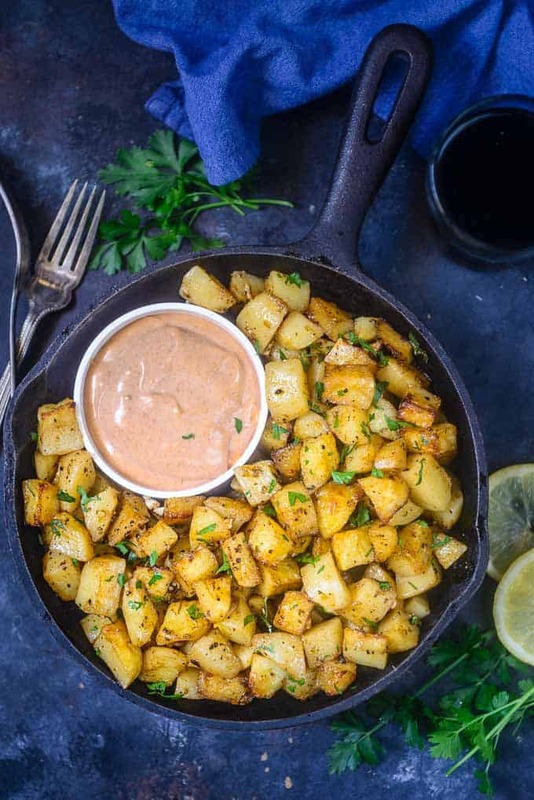 Addition of olive oil, garlic, oregano and paprika makes these potatoes a party starter that everyone will fall in love with. To get the crisp yet soft Greek potatoes, I have used vegetable stock. You can use chicken stock as well. Vegetable stock will help keep the potatoes from burning or over roasting. Also it will help you with the crispy from outside and buttery soft from inside potatoes. I have used some lemon juice to give a zing and tanginess. You can also choose to sprinkle some feta cheese to get your cheese cravings covered. How to cut potatoes for making Greek Potatoes? Depending on the potatoes you are using, you can choose the shape you want. If you are using big potatoes, cut in the shape of cubes or wedges. If you are using baby potatoes, you can halve them and use. For baby potatoes, you can retain the potato skin, which will add to the crispiness. You can also choose to cut thick discs and roast them. 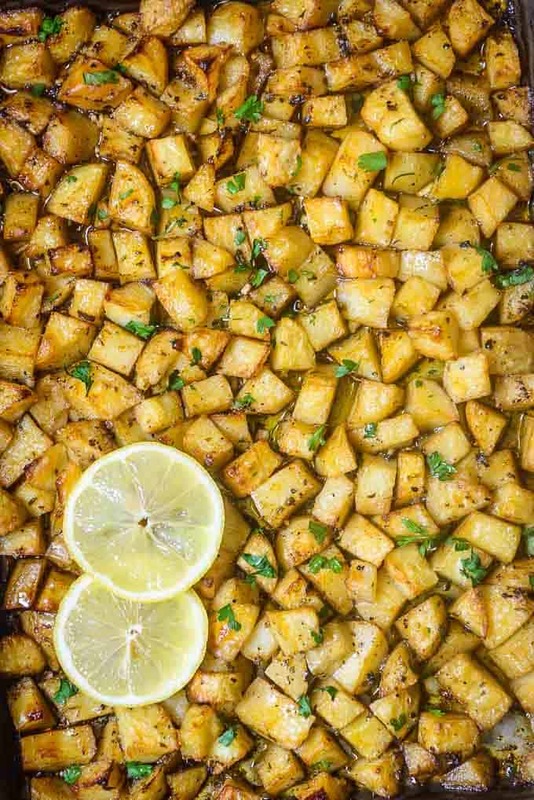 To make these Greek Lemon Potatoes, cut the potatoes into cubes or wedges. Then toss the potatoes with garlic, olive oil, lemon juice, vegetable broth, oregano, paprika, salt and pepper and line them on a rimmed baking sheet. Cover the sheet with aluminium foil and roast for 45 minutes. Then remove the foil, turn the potatoes upside down and roast for another 40-45 minutes until potatoes are browned from the edges. 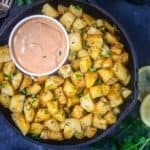 Which Potatoes are the best to make this recipe? Use all-purpose potatoes like Yukon Gold, blue and purple potatoes to make Greek potatoes. You can also use russets and other sweet potato varieties, if you can’t find Yukon Gold or blue or purple varieties. If you can’t find any of these varieties, use big potatoes or baby potatoes. How to make crispy Greek Potatoes? To get crispy Greek potatoes, soak the potatoes in cold water for 30 minutes. This will remove the extra starch and potatoes will crisp up nicely. How to Re Heat Greek Potatoes? If you want to reheat the Greek Potatoes, spread the wedges on a baking sheet and drizzle a little olive oil. Bake them at 450 degrees F for 4-5 minutes in an oven. This will keep the potatoes from become soggy. Can you freeze Greek Potatoes? If you are hosting a big event or have guests coming over, you can cut the cubes or wedges and chill or blanch them in water. Spread the wedges on a baking sheet to freeze, so they don’t stick together. Once frozen you can store them in zip-lock freezer bags. You can also drizzle some oil before freezing and when needed, you can bake or roast them immediately. If you have some leftovers (which I highly doubt, as these Greek potatoes are so finger-linking good that no one can resist), you can freeze them and re-roast them when needed. Just spread the Greek potatoes on a baking sheet, drizzle some olive oil and bake them in oven for 4-5 minutes. What to serve with Greek Potatoes? These Greek potatoes are so good that you won’t need anything with it. But why say no to Tzatziki Sauce or a cheese dip. You can find the recipe to Tzatziki sauce on the blog. You can pair it with some baked chicken as a side dish with some salsa and feta cheese. Sprinkle some parmesan and paprika for more flavour. Soak the potatoes in cold water for 30 minutes. This will remove the extra starch and potatoes will crisp up nicely. Mix minced garlic, extra virgin olive oil, vegetable broth, lemon juice, oregano, paprika, salt and pepper in a bowl. Pour this mixture over the potatoes. Cover the pan with an aluminium foil and bake the potatoes for 40 minutes. Remove the tray from the oven and take off the foil covering. Mix the potatoes with the liquid and turn them upside down. Now bake uncovered for another 40 minutes until the potatoes are golden brown. Transfer the potatoes to the serving bowl. Pour the remaining juice from the baking tray over the potatoes.